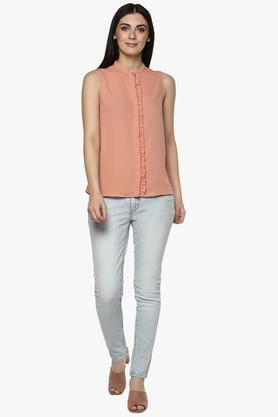 Cut to a relaxed silhouette, this pair of jeans from Levis Ladies are perfect for a casual day out. This pair of mild wash jeans with five pocket features a perfect fit. Made from good quality fabric, they are comfortable to wear and stylish in look. If elegance is your style, then this pair of jeans are perfect pick for you. They can be teamed up with a top and a pair of sneakers to complete your stylish look.